Another successful Division Convention took place this year in Richland, WA. The Washington Artillery Camp in Pasco, WA. hosted this years Convention. Representatives from Camps in Nampa, ID., Pasco, WA., Anchorage, AK.. and Portland, OR. were present. A new Division Commander and Lt. Commander were elected. Commander Leaumont and Lt. Commander Garrett were sworn in after the election. These two men will do a fine job leading our Division for the next two years. This entry was posted in Uncategorized on August 29, 2018 by scvpacnw. 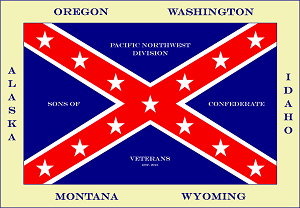 The Sons of Confederate Veterans Pacific NW Division held its 2016 Division Convention yesterday (10/15/16) at the VFW Memorial Hall in Eugene, OR. The Rev. Philip Mulkey Camp 2273 of Eugene, hosted this years Convention. During our business session, we voted on 3 amendments to our Division Constitution and Bylaws. The first amendment changed the names of our regional 1st Lt. Commanders to Brigade Commanders. The second amendment gives the immediate past Commander a vote on the Division Board, but limits him to one vote, even if he holds another office on the Division Board. The third amendment, removing officers from the Board, to be voted on by the Board. After we finished our amendments, we announced the votes for Division Commander and Lt. Commander. Our next Division Commander is John Sigmon and our next Lt. Commander is Garth McKinney. Garth McKinney was sworn is as Lt. Commander. He spoke about some of the goals he has for the Division. Unfortunately due to circumstances beyond his control, Commander elect Sigmon was unable to attend the Convention. He will be sworn in by me at the next local Camp 458 meeting. We had a catered BBQ Dinner, with was fantastic. Following our Dinner, we had several special presentations. Author and Friend of the SCV member Jim Elstad spoke about his experiences promoting the truth about the Confederacy. Afterwards, Division Genealogist Norm Ernst spoke about researching family history to locate Confederate Veterans. Then Camp 458 Commander Jay Willis spoke about Jefferson Davis Park and Davis’ role in establishing the Pacific NW. Next was a presentation by Camp 2273 Commander Chuck Ellis, about Rev. Philip Mulkey and the Long Tommers, their role as Oregon Confederates and the skirmishes they had with Union troops. After all the presentations concluded, I had the opportunity to give my farewell speech. It has been an amazing 4 years since I came up with the idea to start this Division. It is a very good feeling knowing that I can hand over control of a properly functioning Division to our next Commander and Lt. Commander. I am very pleased that Commander elect Sigmon is planning on having me be his 1st Brigade Commander. I look forward to being able to focus specifically on Oregon and Washington, helping promote our organization, grow our Camps, start new Camps and make our Division the shining star for the entire Sons of Confederate Veterans organization. We concluded our Convention with a Candlelight memorial honoring our Confederate Ancestors. After everyone shared the name of their Ancestor and his unit info, we finished the night with everyone singing “Dixie”. I have full confidence in our new Commander and Lt. Commander. They have great leadership skills and we will only see things continuing in the right direction under their leadership. Thank you for trusting me as your Division Commander these last 4 years. This entry was posted in Uncategorized on October 16, 2016 by scvpacnw. SCV Camp 458 4th of July Parade Float a great success! Portland’s Sons of Confederate Veterans Camp 458 participated in the Canby, Oregon 4th of July Parade. We had a tractor, 20′ trailer with banners and flags, and a freshly painted ’71 Chevy 3/4 ton 4×4. I walked next to the float and handed out hundreds of SCV flyers.There were thousands of people in attendance and we received overwhelming support from attendees. Overall it was a great success! This entry was posted in Uncategorized on July 9, 2016 by scvpacnw.